Hurricane Harvey barreled into Texas on August 25th of 2017. Over the next six days, it dumped 52 inches of rain across parts of the state, resulted in 800,000 emergency calls for help, caused 80 souls to be lost, and inflicted over 190 billion dollars in damages. Harvey was the most damaging storm ever to strike the U.S. It was more costly than Katrina and Sandy combined. And recent studies now show that this damage, in large part, was due to climate change’s influence over the storm. According to base climatology, we can expect this kind of event to occur once every 9,000 years. But living in base climatology we are not. Due to fossil fuel burning, atmospheric CO2 levels are above 405 parts per million — levels not seen in at least the past 2.5 million years. Meanwhile, total greenhouse gas forcing (after you add in methane and other heat trapping gasses) is at levels not seen in around 15 million years. So we’re now in a world that’s pretty different from what we are used to. A more dangerous world. How different and how much more dangerous is a measure of some debate. More to the point, the question of how much the presently serious alteration to the world’s climate impacts the world’s weather is a pretty hot topic. What we already know is that the weather is becoming more extreme, more damaging, and that the most intense storms and droughts are growing worse. But boiling it all down to a single storm like Harvey, how much can you blame on climate change? Well, that’s starting to become clearer thanks to a pair of new scientific studies. According to a recent study in the Geophysical Research Letters, human-caused climate change increased Harvey’s devastating rainfall intensity by at least 19 percent and likely by around 38 percent. Enough of a human caused influence to tip the scales between a relatively rough event and an epic deluge for the history books. Meanwhile, another study led by World Weather Attribution, found that Harvey was also three times more likely to have formed in the present human-altered climate. If these peer-reviewed studies are correct, their findings point toward a rather stunning conclusion — the storm was much more likely to form due to climate change and the storm was made much more intense after it formed due to climate change. In essence, the new science finds that climate change’s finger prints are all over Harvey’s devastating impact. Folks around the world take note. Your severe weather has been hyper-charged. Though not on quite the same scale as Harvey, an ‘East Coast Low’ near where i live produced record breaking rainfall in east coast parts of NSW Australia. Maitland in particular record 463 mm in 48 hours. 250 mm of that (10 inches) fell in a 3 hour period. “It’s December. This is the rainy season on the West Coast. In California, it’s missing right now. Not a drop over Southern California. It's December. This is the rainy season on the West Coast. In California, it's missing right now. It’s missing in Phoenix too. More than 110 days, or so, without rain. On 12/17 we do have a 1% chance of rain starting at 4:00AM and rising to 6% by 9:00AM, before dropping back to 1% at 10:00AM. Next 4% chance is 12/22. Wish that high pressure ridge would move along…. The drought killed 129 million trees in California since 2010, 27 million last year. The drought lasted from 2012 through 2017. We’ve had one year of semi respite during which rainfall was arguably too heavy and now this. It would be really nice if all these articles talking about tree death would give figures easy (and terrifying) to grasp, such as “20% of all the trees in California have died in the drought of the last six years” Or, “since 1945, half of all the trees in California have died”. Of course, these are not real figures, but examples, but one gets the idea. I believe it. More terrifying stuff. See above. For the last couple of months (I was not going to post again but the changes are going so fast here it is) I have been watching the wrecked jet stream and cross equatorial flow. That guesstimated figure has gone from about 20-30 degrees pretty steadily to about 100 degrees today. For the first time Earth Nullschool does not show a complete hemispheric shot free of it. The atmosphere might be thin at that level, but these winds can be 112 km/hr or thereabouts near the equator. I am wondering what is going to happen if the area of the hemisphere (Indo/west Pacific) that is mostly unaffected continues to close. If so, that will happen pretty soon. I do hope it is nothing, but I would feel much better if some jet stream expert would tell me this is quite normal and not to worry. Sorry the Pacific shot did not go through. Trying again. It must be making things pretty lively for the airline pilots flying the transatlantic route. Seriously 800,000 calls for water rescue? I know you research things pretty thoroughly Robert, but that’s just an astonishing number of water rescues. And given the severity of the storm it amazing that only 80 souls lost their lives. Exact term was emergency calls. Updated. 80 is a pretty bad number. But it could have been much worse. Physical damage, however, was tremendous. Devastating storm on any level you wish to measure. Even with the broader “emergency call” category, that’s still a huge number of distress calls, and it certainly highlights the enormous human impact of this storm in a way that “dollars of damage”, or “inches of rain” doesn’t fully convey. If the UN’s “famous prediction” is anything like their IPCC’s predictions than 60 years should probably read 25! With oscillating drought/deluge weather we presently see globally food scarcity is surely closing in. Some questions I have are; in a one degree warmer world how much hotter does it have to be in the continental heartland to cover off the lower atmospheric temps over the 70% of the world that is ocean? Does 1c translate to about 3c in the areas where most of the cereal grains are produced? Evaporation rates would seem to imply things over land are reaching crisis points already. Over night lows are now very high and in the polar regions, as we all know, the over night lows are soaring and that night is measured in months! Continuing to farm by flogging the soil with chemicals and breaking it down isn’t going to work out very well. We have more than enough alternative methods available. Methods that will also help with carbon capture and climate resiliency such as regenerative farming and indoor vertical farming while turning over some farmlands to forest. Of course, if we don’t take that path, then the food security situation is likely to get worse due to compounding impacts. new research shows that California’s Sierra Nevada mountain range actually grew in height during the drought years from October 2011 to October 2015. According to a new NASA study, loss of water from the rocks of California’s Sierra Nevada caused the mountains to grow nearly an inch in height during the four-year period, although, the study also found that after the period of drought, two years of abundant snow and rainfall seen in the region helped the mountains regain about half as much water in the rocks as they had lost in the preceding drought, and thereby falling about half an inch in height again. Natural disasters such as the recent Hurricanes Harvey, Irma, and Maria highlight the need for quantitative estimates of the risk of such disasters. Statistically based risk assessment suffers from short records of often poor quality, and in the case of meteorological hazards, from the fact that the underlying climate is changing. This study shows how a recently developed physics-based risk assessment method can be applied to assessing the probabilities of extreme hurricane rainfall, allowing for quantitative assessment of hurricane flooding risks in all locations affected by such storms, regardless of the presence or quality of historical hurricane records. Very helpful line of research they’re pursuing here. Climate change related weather risk analysis would be very useful from the standpoint of planning and preparedness. Scientists have weighed the water that fell on Texas during the record-breaking Hurricane Harvey in August. Category 4 storm dropped 127 billion tonnes, or 34 trillion US gallons. At 242,000 acres and 35 percent containment, the blaze hasn’t been growing as fast during recent days. However, conditions are still quite rough. It looks like the firefighters really know what they’re doing. But nothing is certain at this time. There are 62,000 structures in Santa Barbara at risk. They’re not out of the woods yet by a long stretch. A new map of what lies beneath the Greenland Ice Sheet is published this week (Thursday 14 December 2017). By providing scientists with the most comprehensive, high resolution and accurate picture of the bedrock and coastal seafloor, it reveals how the glaciers that drain from the Greenland Ice Sheet will contribute to future sea-level rise. “New maps of Greenland’s coastal seafloor and bedrock beneath its massive ice sheet show that two to four times as many coastal glaciers are at risk of accelerated melting as previously thought. Researchers at the University of California at Irvine (UCI), NASA and 30 other institutions have published the most comprehensive, accurate and high-resolution relief maps ever made of Greenland’s bedrock and coastal seafloor. Among the many data sources incorporated into the new maps are data from NASA’s Ocean Melting Greenland (OMG) campaign. Lead author Mathieu Morlighem of UCI had demonstrated in an earlier paper that data from OMG’s survey of the shape and depth, or bathymetry, of the seafloor in Greenland’s fjords improved scientists’ understanding not only of the coastline, but of the inland bedrock beneath glaciers that flow into the ocean. That’s because the bathymetry where a glacier meets the ocean limits the possibilities for the shape of bedrock farther upstream…. The new maps reveal that two to four times more oceanfront glaciers extend deeper than 600 feet (200 meters) below sea level than earlier maps showed. That’s bad news, because the top 600 feet of water around Greenland comes from the Arctic and is relatively cold. The water below it comes from farther south and is 6 to 8 degrees Fahrenheit (3 to 4 degrees Celsius) warmer than the water above. Deeper-seated glaciers are exposed to this warmer water, which melts them more rapidly. Morlighem’s team used the maps to refine their estimate of Greenland’s total volume of ice and its potential to add to global sea level rise, if the ice were to melt completely — which is not expected to occur within the next few hundred years. The new estimate is higher by 2.76 inches (7 centimeters) for a total of 24.34 feet (7.42 meters). 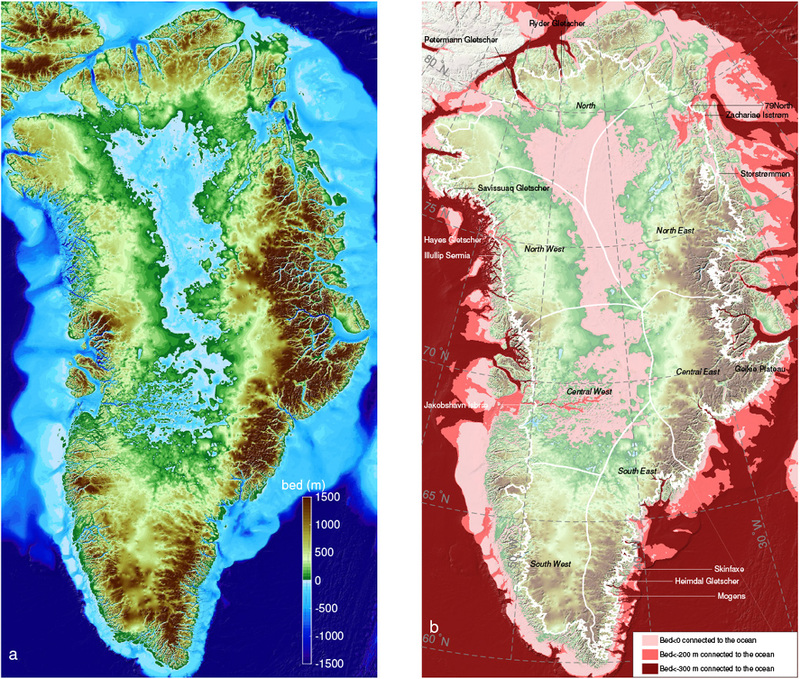 “Left: Greenland topography color-coded from 4,900 feet (1,500 meters) below sea level (dark blue) to 4,900 feet above sea level (brown). “…Included in the new paper are some of the most detailed data yet on the depths of the canyons and fjords scarring the Greenland coast, which carry water in from the sea to lap against the ice. The results suggest that the western and northern regions of Greenland are most exposed to the influence of ocean water. Out of 139 ocean-touching glaciers the team identified, they also found that 67 rest in waters 200 meters (about 650 feet) or more below sea level, where warm water is typically found—at least twice as many as previously thought. And, worryingly, the research suggests that as these glaciers melt and retreat backward, the shape of the seabed will continue to expose many of them to warm ocean water for hundreds of miles as the ice moves inland….. The study also finds that the Greenland ice sheet may contain more ice, with a greater potential to raise global sea levels, than previous research has suggested—about 2.75 inches more, to be exact. Altogether, the new study suggests that the ice sheet has the potential to raise global sea levels by about 24.3 feet, should it melt entirely. But the new information about the interaction between ocean and ice along the Greenland coast may be the maps’ most important contribution. Thanx for the hat tip, Robert. Not certain if this is posted or not ,I will watch this this evening M Mann AGU fall meeting >https://www.youtube.com/watch?list=PL7Ihm2Mh3MZ5cidsvhD1mOa9dgO7gtdCI&time_continue=7&v=7i2k2tpbfVk . Thanks for this, Jeff. Will be very interested to see what Mann has to say. So climate change is the compounding factor that makes everything else more difficult. The military was right to call it a threat multiplier. But this is true well outside of the military forces frame of reference. If you hurt the natural balance by making things too warm, everything else becomes more difficult (reforestation, farming, conservation, etc). You’ve got to first stop the damage by removing the source of the harm (fossil fuel burning). And then you’ve got to work hard to regenerate the land, to capture carbon from the air. We’ve had this system of destruction for so long. But we need to move rapidly to a system of preservation and renewal. The FCC ignored 18 state attorneys general who asked that the vote be delayed for an investigation into the “corrupted” public comment process. Marine angiospermas are a unique group of flowering plants that have adapted to live completely submerged in the sea for 40 million years. They form dense, productive grasslands and provide a wide range of ecosystem functions and services such as nutrient regeneration, improved water quality, coastal protection, breeding habitats (including economically relevant species) and CO2 burial. But as beneficial as they are to our environment, marine phanerogams are also among the world’s most threatened ecosystems as a result of human pressure, with an annual global decline rate of 7% and nearly 14% of all species at risk of extinction. The oldest ice core ever drilled outside the polar regions may contain ice that formed during the Stone Age—more than 600,000 years ago, long before modern humans appeared. This short film provides an overview of the autumn 2015 expedition to the Guliya Glacier in Tibet to drill ice cores that yielded the oldest ice outside the polar regions. The film was created by BPCRC media specialist Pam Theodotou using field footage collected by expedition member Giuliano Bertagna. Cores were drilled at 21,981 feet. One of the biggest science meetings on the planet is underway in New Orleans right now. The AGU meeting is huge and a LOT of newsmaking science comes out of it. This year is no different. Now, I know that most people will not take the time to read even the summaries from this special edition, but there are two graphs from a paper in the BAMS special edition that everyone should see. It shows that those who still believe the warming is natural are unarguably, and completely wrong. What you’re looking at is a prediction of Earth’s temperature from a suite of the most sophisticated climate models. These are the CMIP5 models, and they can be used to see how changing Earth’s atmosphere, ground cover and even volcanic activity changes the planet’s temperature. These CMIP5 models are designed to predict climate, not weather, and these graphs show they do it well. One thing to remember is that all models are wrong, but they often give valuable information. So, let’s start with the model run on the right (blue). This run assumed that greenhouse gas levels have not changed since the 1800’s. Only the atmospheric changes from volcanic eruptions and the very slight solar energy changes are included. In short, they assume the industrial revolution never happened. The dark blue line is the average temperature from a bunch of different runs (the lighter blue is the range of all the different runs of the model). As you can see, the planet’s temperature does not vary much since 1880. Some years are warmer, some colder, and a few are really cold or unusually mild. The black, purple, and green lines are independent reconstructions of the Earth’s temperature since 1880 from NASA, NOAA, and the Hadley Center (UK). Note how close they are and how different they are from the CMIP 5 model run. Now, look at the graph on the left. This model run added in the greenhouse gas levels as they changed and you see a much different story. The average of these model runs track very closely with the temperature reconstructions from 1880 through today. The models get it right, and they only get it right when we add in the rising greenhouse gases.